I have seen the future of horror…his name is Clive Barker. Earlier this month we did an entire podcast on Hellraiser, to date it is a longest podcast we have filmed. Check it out if you can, it is on our Facebook and Youtube channel. 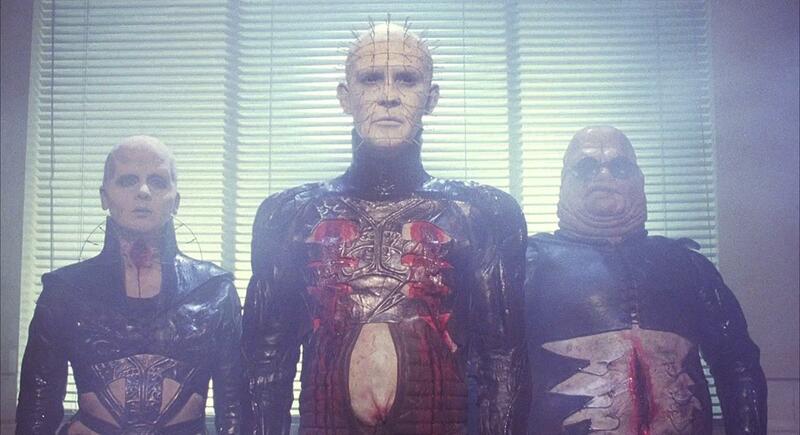 Hellraiser is one of those films that is not like anything we had ever seen. I put off watching Hellraiser for many years because or the previews and availability. But mostly, I was worried about what I would see. It took one late night and 1990s cable for me to dip into the world of Hellraiser, thanks to Hellraiser III: Hell on Earth. From that point on I was all in and finally got around to watching Hellraiser and Hellbound: Hellraiser II. I would of course follow the series as the films came out and one by one, each was worse than the last. 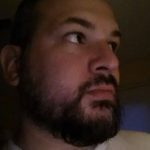 Looking back at each movie, they are not too bad. Hellraiser has nine films in all, with the tenth, “Judgement” coming this year, 2017…maybe. 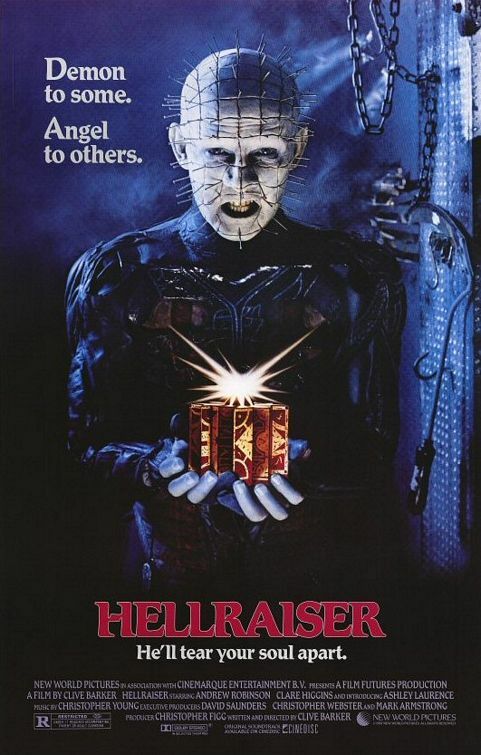 The film Hellraiser is based from the book by Clive Barker, the Hellbound Heart. Although the movie changed from what is the actual book, the movie is a classic in its own right. Of course, this is about the movie not the book. A lot of people say, “The book was better” or “Hollywood changes books”. Well, this time it was the writer of the book making changes. Clive Barker wrote the screenplay and directed the film. So every change made in the film, he made. As for the title, well, that was Hollywood baby. They thought the Hellbound Heart was more of a love story title rather than horror. One thing people associate with the movie and is even on the poster is Pinhead and the Cenobites. They play a big role but have little screen time. When the come back to the movie towards the end, it is maybe the best part of the movie. Doug Bradley nearly steals the movie as Pinhead. But the movie really revolves around Uncle Frank…you remember, come to Daddy. Sorry, one of the most bizarre moments in the film. Frank Cotton was in hell thanks to the puzzle box or the Lament Configuration. It takes whoever opens it to their pleasure and pain. Frank would meet the Cenobites and eventually escape them. When his brother moves into the house Frank was squatting in, his blood activates one of the most impressive resurrection scenes ever. Julia finds Frank and we learn they were lovers. She brings him men to feast on and help him get closer to being his old self. Eventually, his niece Kirsty finds the box and makes a deal with Pinhead and the Cenobites. I love Kirsty, played by Ashley Lawrence, she is in three of the ten films and she is the only person to make a deal with Pinhead. Hellraiser is iconic, if I had my way, Hellraiser is a top 10 horror movie that should be celebrated. I watch Hellraiser and Hellbound monthly, these movies were such a change from what was going on with slahser films in the 1980s and it was welcome. I think it is hard to give Hellraiser a sub-genre, not a slasher film, oh no not at all. There is so much to the film, with religious aspects, monsters and more. In many ways, I feel Hellraiser is a damn near perfect horror movie, one that comes along very rarely. Hellraiser is now and belongs in our Horror Hall of Fame, what do you think? We would love to hear from you, Facebook, Twitter, you know where we are. How do you feel about Hellraiser?